The Rapid Sand Filter (RSF) water treatment equipment differs from the Slow Sand Filter water treatment equipment in a variety of ways, the most important of which are the much greater water treatment filtration rate and the ability to clean automatically using back washing. The mechanism of particle removal also differs. Rapid sand Water treatment filter does not use biological filtration and depends primarily on mechanical straining, sedimentation, impaction, interception, adhesion and physical adsorption. In Rapid sand water filter the complete filtration cycle (filtration and back washing) occurs sequentially. Water Treatment Filters that must be taken off-line periodically to back wash are classified operationally as semi-continuous. Water Treatment Filters in which filtration and backwash operations occur simultaneously are classified as continuous. There are a number of different types of Rapid sand filters depending upon bed depth (e.g., shallow, conventional and deep bed) and the type of filtering medium used (mono-, dual-, and multimedia). A further classification can be made based on the driving force as gravity Water Filters or pressure Water filters. Typically sand is used as the filtering material in single medium filters. Dual- medium filters usually consist of a layer of anthracite over a layer of sand. Multimedia filters typically consist of a layer of anthracite over a layer of sand over a layer of garnet. In constant-rate filtration with fixed head, the flow through the filter is maintained at a constant rate. They are either in-fluent controlled or effluent controlled. Pumps or weirs are used for in-fluent control whereas an effluent modulating valve that can be operated manually or mechanically is used for effluent control. In constant-rate variable filtration head, the flow through the filter is maintained at a constant rate. Pumps or weirs are used for in-fluent control. When the head or effluent turbidity reaches a preset value, the filter is back-washed. In declining-rate filtration, the rate of flow through the filter is allowed to decline as the rate of head loss builds up with time. Declining-rate filtration systems are either in-fluent controlled or effluent controlled. In the effluent controlled type of filters, the filter effluent lines are connected to a common header. A fixed orifice is built into the effluent piping for each filter so that no filter after washing will take an undue share of the flow. The filtered water header pressure may be regulated by a throttle valve which discharges to filtered water reservoir. Costly rate controllers are replaced with fixed orifices and therefore, would make the units economical particularly in large water works involving batteries of filters. For equal duration of filter runs the total output per day from a declining rate filter is higher than that in the conventional filters. In group of filters operating at an average rate of 10 m3/m2/hr, the fixed orifice will be so designed that a recently cleaned filter will begin operation at 15 m3/ m2/hr while the filter next in line for cleaning will have slowed down to about 5 m3/m2/hr. Usually the depths of filter boxes for declining rate filters are more than those for the conventional ones. These would permit longer filter runs and consequent reduced wash water requirements. The filter beds are operated by scheduled cleaning in such a way that each of beds will be in different stage of filter cycle producing the required average flow. When the rate of flow is reduced to the minimum design rate, the filter is removed from service and back-washed. In an inlet-controlled filter, the rate of flow is controlled proportional to the rate of filtration with float control arrangement to the inlet valve. Inlet control reduces the amount of work which has to be done on the filter to just clean it. The Above Figure shows a typical rapid sand filter water treatment with components. The filter is contained within a filter box, usually made of concrete. Inside the filter box are layers of filter media and gravel. Below the gravel, a network of pipes makes up the under-drain system which collects the filtered water and evenly distributes the backwash water. Washwater troughs help distribute the in-fluent water and are also used in collecting the dirty washed water during backwashing. In addition to the components mentioned above, most rapid sand filters contain a flow controller, or filter control system, which regulates flow rates of water through the filter. Other parts, such as valves, a loss of head gauge, surface washers, and a backwash pump, are used while cleaning the filter. Operation of a Rapid sand filter during water filtration is similar to operation of a Slow sand filter. 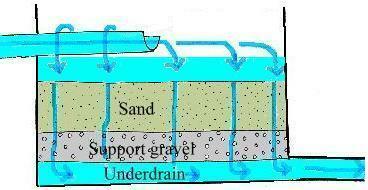 The influent water flows down through the sand and support gravel and is collected by the underdrain system is shown in the above Figure. However, the influent water in a rapid sand filter is already relatively clear due to coagulation, flocculation and clarification, so RSFs operate much more quickly than SSFs. The rate of filtration varies from 80 to 120 Lpm/ m2 (4800 to 7200 Lph/ m2) of filter bed area or 4.8 to 7.2 m/ h. The average rate of filtration for design purpose may be assumed as 100 Lpm/ m20f filter area or (6m/h). The filter tank is generally constructed of concrete and is most often rectangular. Filters in large plants are usually constructed next to each other in a row, allowing the piping from the clarifier basins to feed the water treatments filter from a central pipe gallery or from a inlet channel. The sizes of the filters vary according to the quantity to be treated. The number of filters is selected to minimize the effect of removing the filter from service for washing on remaining filters. The larger the number, therefore, the better it is, for the proper operation. Ideally it should be possible to take three filters out of service simultaneously (one draining down, one washing and one for maintenance). A minimum of four filters is desirable, although two to three filters may be used for small plants. Water treatment filter bed sizes vary from 25 to 100 m2 with lengths in the range of 4 to12 m and widths in the range of2.5 to 8 m and length to breadth ratio of1.25 to 1.33. The wash water collection channel is located on one side along the length of the filter. Filter beds of twice this size can be constructed as two identical beds separated by the wash water collection cham1el, thus limiting the length of travel of feed water to 5 m. A minimum overall depth of 2.6 m including a free board of 0.5 m is adopted. 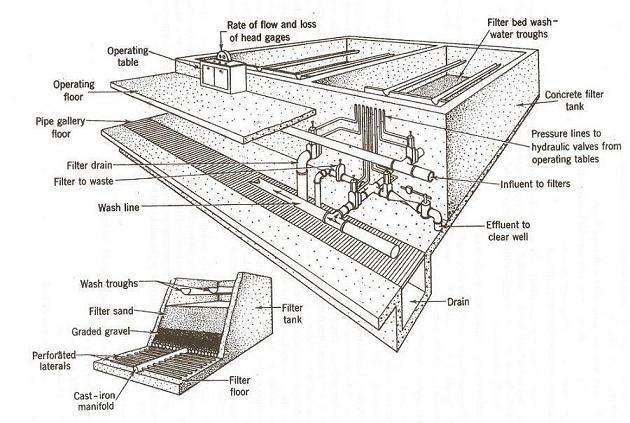 Fig shows the cut section of RSF box showing the under drainage system, gravel, sand media and wash water gutters. The filter media is the important component of the water treatments filter which actually removes the particles from the water being treated. Water Treatment filter media is most commonly sand, though other types of media can be used, usually in combination with sand. The sand used in rapid sand filters is coarser than the sand used in slow sand filters. This larger sand has larger pores which do not fill as quickly with particles removed from the water. Coarse sand also costs less and is more readily available than the finer sand used in slow sand filtration. The filter sand used in rapid sand filters is prepared from stock sand specifically for the purpose. Most rapid sand filters contain 60 to 75 cm thickness of sand, but some newer filters are deeper. The sand used as filter media in RSF is generally of effective size of 0.4 to 0.7 mm and uniformity coefficient of 1.3 to 1.7. The standing water depth over filter varies between 1.0 and 2.0 m.
The water filter gravel at the bottom of the water filter bed is not part of the filter media and it is merely providing a support for media above the underdrains and allowing an even distribution of flow of water across the filter bed during filtering and backwashing. The gravel also prevents the filter sand from being lost during the operation. The filter gravel is usually graded of size from 2.5 to 50 mm (largest size being at the bottom) in four to five layers to total thickness of 45 to 50 cm, depending on the type of under drain system used. In case the under drainage system with pourous bottom or false floor no gravel base is required. The filter gravel shall be classified by sieves into four or more size grades, sieves being placed with the coarsest on top and the finest at the bottom. 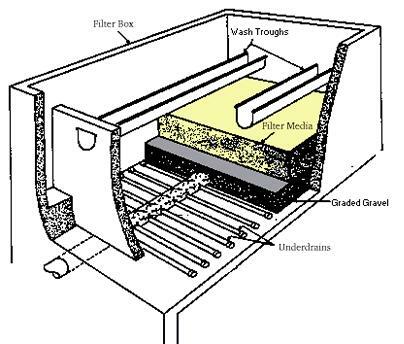 The under-drainage system of the water filter is intended to collect the filtered water and to distribute the wash water during backwashing in such a fashion that all portions of the bed may perform nearly the same amount of work and when washed receive nearly the same amount of cleaning. Since the rate of wash water flow is several times higher than the rate of filtration, the former is the governing factor in the hydraulic design of filters and under drainage system, which are cleaned by backwashing. The most common type of under-drain is a central manifold with laterals either perforated on the bottom or having umbrella type strainers on top. Other types such as wheeler bottom, a false bottom with strainers spaced at regular intervals or a porous plate floor supported on concrete pillars are all satisfactory when properly designed and constructed. Wash-water troughs placed above the filter media collect the backwash water and carry it to the drain system. Proper placement of these troughs is very important to ensure that the filter media is not carried into the troughs during the backwash operation and removed from the filter. The upper edge of the washwater trough should be placed sufficiently nearer to the surface of sand so that a large quantity of dirty water is not left above the filter sand after completion of washing. At the same time, the top of the wash-water trough should be placed sufficiently high above the surface of the sand so that the sand will not be washed into the gutter. Width of the filter bed must be equally divided by the troughs so that each trough covers an equal area of the filter. Maximum clear spacing between the troughs may be 180 cm. The horizontal travel of wash-water to trough should not be more than 90 cm. All the wash water troughs must be installed at the same elevation so that they remove the backwashed water evenly from the filter so that an even head is maintained across the entire filter. The troughs may be made with the same cross-section throughout its length or it might be constructed with varying cross-section increasing in size towards the outlet end. The bottom of the troughs should clear the top of the expanded sand by 50 mm or more. These wash water troughs are constructed in concrete, plastic, fiberglass, or other corrosion-resistant materials. The troughs are designed as free falling weirs. Proper backwashing for cleaning the water treatment filter is a very important step in the operation of a water filter. If the filter is not backwashed periodically, it will eventually develop additional operational problems. If a filter is to operate efficiently during a filter run it must be cleaned regularly at every 24 to 48 hours. Treated water from storage is used for the backwashing. This treated water is generally taken from elevated storage tanks or pumped in directly from the clear water drain by passing in the reverse direction from under drains to the media. 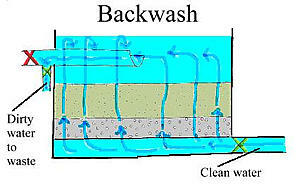 The below Figure shows the flow pattern during the backwashing. During filtration, the grains of water filter media become coated with the floes, which plug the voids between the filter grains, making the filter difficult to clean. Backwash should, therefore, be arranged at such a pressure that sand bed should expand to about 130 to 150% of its undisturbed volume so as to dislodge the deposited floes from the filter media during the backwash. Washing causes the sand grains to impinge on one another and thus dislodging adhering floc and, the rising wash water carries the material and discharge into the gutters. The backwash flow rate has to be great enough to expand and agitate the filter media and suspend the floes in the water for removal. On the other hand an unduly high rate of flow will cause more expansion than needed, so that the sand grains will be separated further and scrubbing action will be decreased and the media will be washed from the filter into the troughs and out of the filter. A normal backwash rate is 600 Lpm/ m2 of filter surface area without any other agitation. The pressure of the wash water to be applied is about 5 m head of water as measured in under drains. Backwashing normally takes about 10 minutes, though the time varies depending on the length of the filter run and the quantity of material to be removed. Water filters should be backwashed until the backwash water is clean. For high rate back wash, the pressure in the under drainage system should be 6 to 8 m with wash water requirement being 650 to 850 Lpm/ m2 of filter (40 – 50 m/hr) for a duration of 6 to 10 minutes. In most cases the filter backwash rate will not be sufficient to break up the mass on the top of the filter. During filter backwash, the media expands upwards and around the washing arms only. If air is forced through the under-drains until the sand is thoroughly agitated, for a period of about five minutes the expansion of sand media and complete removal of the floes could be achieved. In the air wash system, compressed air is used to secure effective scrubbing action with a smaller volume of wash water. The air may be forced through the under drains before the wash-water is introduced or through a separate piping system placed between the gravel and the sand layer. Though the former results in better washing, the gravel is likely to be disturbed. The cleaning of water treatment filter with air agitation followed by backwash is a very efficient method but requires the installation of a large air blower to produce the air. The normal design of backwashing employing conjunctive air and water wash, air will be applied at 700 to 850 Lpm/ m2 of filter area (45 – 50 m/hr) and water at 200 to 250 Lpm/ m2 of filter area (12-15 m/hr). The upper layer of the water filter bed becomes the dirtiest and any inadequate washing will lead to the formation of mud balls, cracks and clogged apots in the water filters. These troubles are overcome by adequate surface wash which can be accomplished by stirring the expanded water treatment filter bed mechanically with jet of water directed into the suspended sand. Surface washers spray water over the sand at the top of the filter breaking down mud-balls. 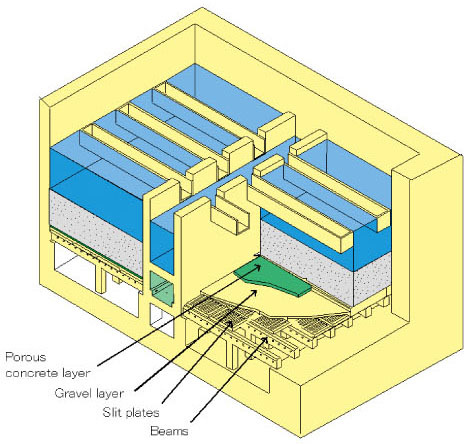 The below Figure shows the surface wash arrangements. Please what is the Physical and Material differences between Nozzles and the Under drain in Water Treatment plant. I am an Engineer from Ogun State Water Corporation, Abeokuta, Nigeria. The Filters in our water sytem is collapsing daily, I see the need for total Rehabilitation. Please can you assist me the differences between Nozzle system and the Underdrain system. What is the physical properties of both? Kindly assist. Just visit below link to get more information about Slow Sand Filters and Rapid Sand Filters. and when should we backwash the filter. is there any criteria about that? and, how much is the headloss through a sand filter, typically? ρ = density of the fluid at all points in the fluid. Why we say the area of rapid sand medium filter tank must not less than 10m^2? Because of the back washing area required. Please how can one assess the potential use of waste materials as filter media for water treatment? Sand filters are very common, easy to understand and use and inexpensive. They are considered the least effective type of filter, but are still incredibly popular. The swimming pool filter is filled with sand. Pool water is pulled into the filter and pressed through the sand. The sand filters out particles from the water. Thank you for the information shared. Just wander what will happen if the filter did not follow the recommended length to breadth ratio of1.25 to 1.33? thank a lot and very useful. how to calculate the flow in / out and measure the flow of the gravity filters. Your water filtration method post provided us useful information to work on. You have done a outstanding job! interesting site, very interesting. I like water treatment corrosion. Excellent web site in water treatment. Plenty of useful info here. thanks. Great learning….nice and good information. Thanks. thank a lot for very useful information about of filtration. If back washing is carried out in a proper manner how long will the sand media (of a RGF) last. Is it absolutely necessary to replace the sand media after 5-7 years. Maintenance involves annual removal of the top layers os sand. Raw water is treated with alum and cationic poly electrolyte and then led to the single media filter after coagulation, flocculation and sedimentation. Water is sourced from a river. The filters are provided with header-lateral underdrains and backwashing consists of air scouring followed by water washing. Am waiting please because i want to install in my factory for potable water production.Thanks. Very useful and clear information. Thank you so much! I am an engineer and working for POublic water supply system.we are going to construct a rapid sand filter nozzle type.please inform whether the filters are placed in enclosed building or in open.Is there any disadvantage in keeping the filters open to sky.What i feel is the algae formation will frequently disruopt the working of filters.am i right or wrong. Yes your thinking is correct? No problems to keep sand filters as a outdoor unit.Keep such as maintaining adequate water circulation, proper filtration, a routine maintenance schedule, frequently of backwash and flushing time is need more for outdoor unit then only we can avoid algae formation. i m a engineering student, it helped me a lot to prepare the note on sand filtration . Thank you for kind cooperation. Where can i get the replacement glass caps that go on my Rapid Sand Filtration Filter System??? On the surface sweep, how far below the media should it be during backwash? Before backwash is started the surface sweep is about 4 inches above the media before bed rise. i would like to design the sand filter for removal of the SS from waste water. can anybody help me with equation to decided the diameter, height and gravels level to be consider along with size. What is the relationship sand depth and efficiency of rapid sand filter? WHERE CAN BUY THE SPHERICAL STRAINER NOZZLE, NEED FOR A MAINTNANCE PLANT 4000 PCS SHORT STEN, 3/4 MFT. Thank you very much. Quite useful information.